I'm happy if I hit the rats at 25 yards. 1107 yards!?!? Whoa, that's some fine shooting! What weight bullet are you shooting? And how fast? And just out of curiosity what is the drop you are allowing for? Thanks for the response.....sounds like you've got it figured out. What program are you using to determine your energy at 1100 yards? 217 fpe seems pretty high to me. But I may be wrong. 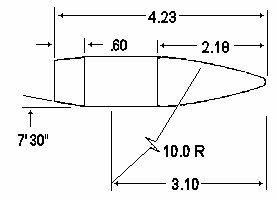 I am using G7 with Hornady Ballistics Calculator, it is not the best for lead bullets but it will put you in the right starting point. 1107 target? ( 20/1 LEAD) The BC .271 is taken from RCBS CAST BULLET book this is a RCBS 308 150 SP, this mold has been discounted from there line of molds but it has work very well in air guns and powder burners. The Texan has a 1/14 right hand barrel will work with bullets up to 198 grain at close range 300 yards past 300 yards you need to stay with 171 or lighter this is what I have found shooting the 308 Texan. This is when a Labradar would come in very handy! RCBS has the money to spend on their bullet design so this is what I will use . This is not going to end well for obvious reasons.